Streetcars are returning to Salt Lake City! With the Sugar House Streetcar (now called the S-Line) opening on December 8, Salt Lake City is exploring a vision for streetcars in the downtown core. 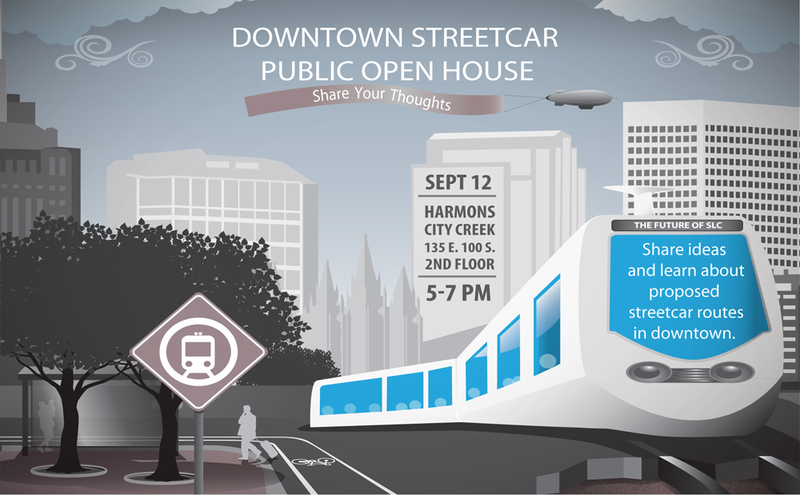 A public open house has been scheduled to share ideas and educate residents on the current proposed streetcar routes. Thursday, September 12 from 5-7 p.m. Learn more about the visioning project. What’s your vision of the future of Salt Lake City? We have two unique opportunities for you to weigh in! The Salt Lake City International Airport is building a new terminal, and they are looking for your best ideas! Explore the plans for the brand new terminal complex and tell them what you think they should focus on. One tidbit we learned from visiting their site – the new terminal will be designed to high environmental standards and will aim for meeting a LEED Silver Rating or better from the U.S. Green Building Council. Nice! Plan Salt Lake is a citywide vision that will help guide the City into the future, which will bring together all of the existing citywide policies and help residents, business owners, visitors and City decision makers make decisions today that will impact tomorrow. Let them know what you value about Salt Lake City and be a part of this important conversation! Salt Lake City Green is working on a Sustainable City Dashboard that will provide an opportunity for residents to engage in a multifaceted conversation about sustainability in our community.